Mr. Paul is our next door neighbor and the cutest old man you’ve ever seen (he probably won’t like me calling him old – sorry about that Mr. Paul – how about “older” – but I would love for you to be my grandfather!). He’s as sweet as he is cute. Cooper (our new pup) is quite taken with him too. EVERY time we go out to use the bathroom Cooper is straining his little head to see if Mr. Paul is working out in his garden. 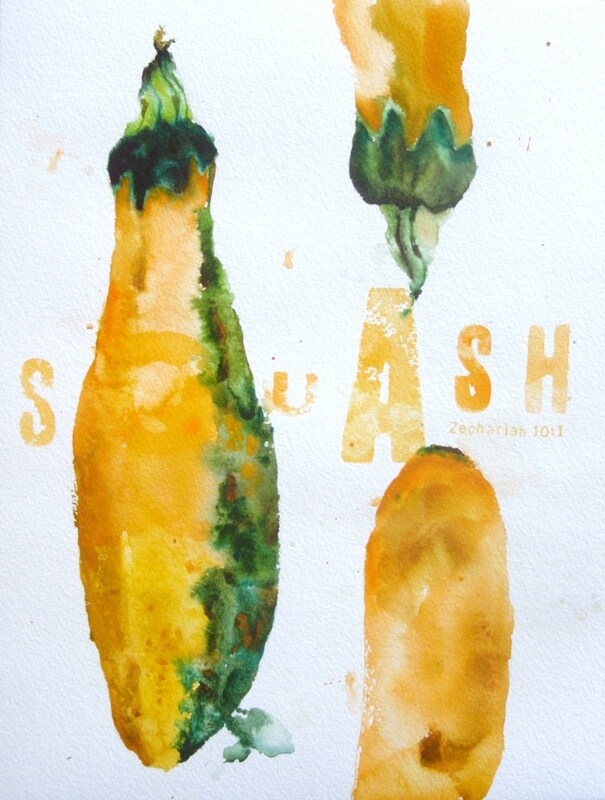 These first two paintings are of harvests from Mr. Paul’s garden that he has shared with us. I’m always so excited to get something from him because not only is it yummy but it’s always something fun to paint. Like those squash above – they were the prettiest yellow and green striped squash I’d ever seen. He asked me to paint them for him. He’ll probably read this post before I have a chance to give him the painting (I still need to get it matted for him). I love how it turned out – it just speaks summer. I’ve also painted many other things associated with Mr. Paul. Above is his house and blue truck that is always parked by his house. I’ve painting the field that’s behind both our homes (below). 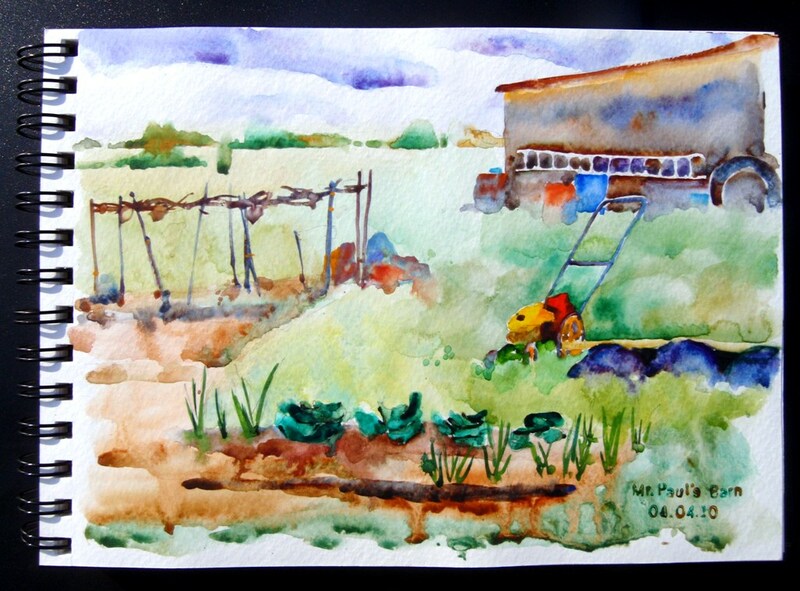 And this last one was really fun to paint – his garden and shed. I actually moved some of these things around – his shed isn’t actually that close to his garden but I used my artist license and put it there :). One of these days I’m going to have to paint Mr. Paul because he wears this great old straw looking hat when he’s out working in the garden that I just love. Mr. Paul, thanks for all the inspiration – you’ve given me LOTS to paint! Don’t forget you can click on any of the pictures to see them larger. Oh wow… your paintings are gorgeous!